The populist wave of 2016 saw politicians pushing back against experts, both during the Brexit debate and the U.S. presidential campaign. Economists in particular saw their views repudiated as voters and parties turned their backs on many central tenets of mainstream economics, particularly the benefits of free trade. This backlash against intellectuals poses a question: When should the public place its trust in expert opinion? It might be that we trust experts when they have reached a policy-relevant consensus. For example, support for policies to address climate change is based on a broad consensus among the experts that global warming is the result of greenhouse gas emissions. Another possibility is that we might trust professional opinion when it is independent of party and ideology. Experts are also citizens, and they may not distinguish between their political views and their expert knowledge when addressing policy questions. If political ideology influences professional opinion, it is unclear that experts have any special claim to the public’s trust. So is the economics profession dominated by consensus or ideology? As sociologists, my co-authors and I suspected that terms like “faction” and “polarization” do not really capture ideological debates among economists. We used a method better suited to identifying what we call ideological alignment: the intuitive idea that some people are on the far left, some in the middle, others on the moderate right, and so on. We tested this idea in a recently published paper and found that there is more evidence of ideology than previously claimed. The diagram below represents the “latent ideology” of economists: their tendency to hold pro-market, interventionist or centrist beliefs. What are the key findings? First, on hot-button political issues, economists do indeed line up on an ideological spectrum ranging from committed supporters of the free market (on the right of the diagram) to those much more open to government intervention and regulation (on the left). Respondents on the right are more likely to agree that public spending has low returns and support school vouchers. Those on the left are more likely to support the Affordable Care Act and raising the minimum wage. The second characteristic is the academic department that the panelists work in. Some practitioners use the terms “freshwater” and “saltwater” to contrast the free market economics practiced at the University of Chicago with the more Keynesian flavor of Harvard and MIT. The coloring of the figure reflects this difference — red is freshwater, blue is saltwater. 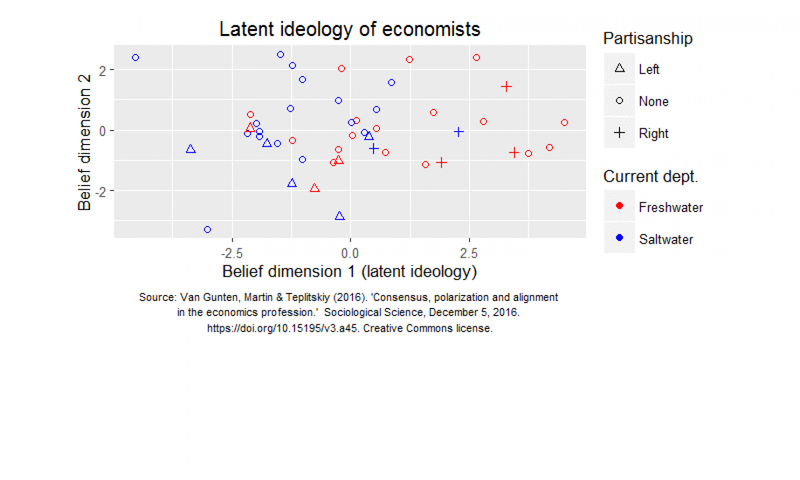 Again we found that economists clearly on the right end of the ideological spectrum tend to work in “freshwater” departments and vice versa. There is a “tidal zone”: economists in the center work at either flavor of department. But taken together, department and party affiliation almost perfectly classify respondents who are outside of the center. These results don’t imply “polarization” — there are no warring camps or factions — but there is clear alignment on a left-right ideological dimension. These findings all reflect the ways in which disagreement between economists is structured. They don’t address the consensus question: How much do economists agree? We don’t dispute previous research arguing that there is a lot of consensus among economists. The problem is that measuring consensus is trickier than it seems. If you survey any group on “easy” questions — questions that most members of the group agree on — you find a lot of consensus. If you ask hard questions — the kind of questions that a group like economists spends most of their time trying to answer — you find less consensus. So what’s the right set of questions? There’s no single answer. But if economists want to convince the public that their professional opinions are free of ideology, the rigorous way to test that hypothesis is to ask themselves hard questions: the kind of questions most likely to elicit disagreement. Despite other strengths, the Economic Experts Panel was just not designed with this goal in mind. As a result, simply adding up the number of questions on which respondents agreed is pretty meaningless. Although our research was not designed to evaluate economics as a source of policy advice, one may draw a couple of provisional conclusions. The public should not always distrust economists, although healthy skepticism (as opposed to head-in-the-sand denialism) is arguably always a good thing. However, given the current political climate, professions should be cautious in trying to sell the public on the idea that they have all the answers. It is tempting to react to anti-intellectualism by doubling down in defense of professional expertise. But promises of “just trust us, we’re the experts here” can backfire when the public learns that the emperor has no clothes. In the current climate, those who care about facts-based policy debate (an endangered species these days) should treat public trust in experts as a scarce resource. Those economists who insist on their impartiality should take a long, hard look in the mirror and ask whether denying that ideology influences their professional opinions is the best way to regain the public’s trust. Tod Van Gunten is a Research Fellow at the Max Planck Institute for the Study of Societies in Cologne, Germany. This article was first published on December 13, 2016 as “Economists are like the rest of us. Their views on controversies line up with their ideologies.” in The Monkey Cage at the Washington Post.